Resting on 120 acres of woodland where the mountains touch the waters of Kootenay Lake, Yasodhara Ashram is a vibrant spiritual community. People come here from all over the world to learn about yogic practices year round. Swami Radha founded the Ashram in 1963 and it continues to grow and thrive. Coming to the Ashram as a retreat guest is a peaceful and flexible way to experience life in this vibrant spiritual community. A retreat at the ashram provides the perfect setting to experience yoga as more than just the physical practice. Reinvigorate and go deeper with your own yoga practice or experience an authentic introduction to these ancient teachings. Your retreat experience is yours to create. We are open to retreat guests year-round and the length of your stay is up to you. As a visitor, come visit the Temple of Divine Light, or our bookstore and gift shop, open 9 am - 6 pm daily, with few exceptions. "Forgiveness welled up... Acceptance brought peace to my heart." -Daphne Gordon The Toronto Star. 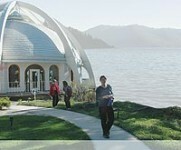 Yasodhara Ashram is the winner of the 2009 Tourism BC Environmentally Responsible Tourism Award, which acknowledges outstanding leadership in environmental sustainability. Come visit Yasodhara Ashram, a vibrant spiritual community resting on 120 acres of woodland where the mountains touch the waters of Kootenay Lake. Come for an hour, a day, a week, or more. Our facilities, including a bookstore and gift shop, are open year-round from 9 am - 6 pm, with few exceptions. Or join us for Satsang in the Temple of Light from 8 - 8:45 pm most evenings. In the summer the Ashram hums with courses, celebrations, and teacher training programs. Any time of the year, the Ashram is a place to go within, grow, and be inspired by the beauty of our natural surroundings. A retreat at the ashram provides the perfect setting to experience yoga as more than just the physical practice.